The current Aughton & Ormskirk U3A Website has been going now for 3 years. The Web Team hope you find it informative and useful. We know that some potential members do refer to it prior to joining, so please help us keep it interesting and relevant. This year, we have been making some changes to help the Website adhere to the new GDPR (General Data Protection Regulation) law. Please do a quick check for any text or photos referring to you and contact the Web Team if there is anything you would like removing or changing. The Web Team would like to thank all the Group Authors, past and present, for their invaluable help in maintaining a very good proportion of the Pages on our extensive List of Groups. Much appreciation should also go to Willem Wiechers, the IT Manager, who does all the essential background work relating to the running of WordPress on the Host Server. And to Margaret Wiechers, the previous Web Master for her continued help and advice. A message from Dennis Morley who manages the U3A ‘assets’. In an attempt to create space, all group leaders who use equipment stored in the cupboards at the back of the Ormskirk Room (where tv is sited) are asked to inform Dennis Morley which item/s they use , and on which day they use them, giving details of make, model, serial number etc. It is intended to write off any unidentified items at the end of January 2019. We are interested in your views on what is good about our U3A and your suggestions for improvements. Following the 10.30 am announcements at Horizons on Thursday 27 September, we invite you to share your thoughts, views and opinions about our U3A and how we can work together for the benefit of us all. This will be an informal session for about 30 minutes. 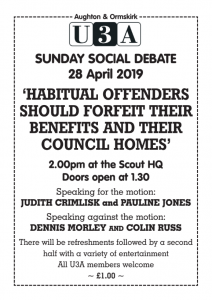 We hope you will join in the discussions. If you missed this Horizons Meeting, you can still come along to another one any Thursday morning. There are always some members of the Committees and Groups around to listen to, and pass on, your views and questions. And, if you cannot come then in person, there are alternative ways of contacting appropriate Officers via the Contact Us Page. Do you have an interest or experience in stage/drama productions, theatrical lighting and sound systems? If so, the Drama Group would love to hear from you. At our normal venue, Aughton Village Hall, a brand new lighting system has been installed which will open up new opportunities for our twice-yearly productions. If you are interested in becoming involved or want to find out more please contact the Drama Group Leaders John and Megan Tomlinson on 01695 578207. We welcome Paul Atherton who will tell us all about Norse Mythology. He’s no stranger to our U3A as he has spoken to the Local History Group but the subject is endlessly fascinating and more information can be found on this link. Come along and join Paul at 10.30 am in Christ Church. Everyone is welcome. Thursday 13th September – our Guest is a representative from Preston Care & Repair. They hold the contract in West Lancashire for helping to make life easier for older, vulnerable or disabled people and anyone with a long-term health condition that affects their mobility of independence in the home. Come along and talk to their representative. They will be with us for the whole morning 9.30 through to 11.30 in the Scout & Guide HQ. More information on this link. Maintaining accurate records for all our members on the Beacon Membership System is vital in order to keep you all informed. Please let us know if any of your personal details change e.g. address, telephone number, email address so we can keep the database up-to-date and ensure you receive your monthly enews and correspondence etc. If you become aware of a change in a member’s circumstances, please contact us so we avoid sending correspondence when it may not be appropriate. or at Horizons every Thursday morning. After the usual August break we welcome Paul Atherton with stories of Viking Mythology. GDPR (General Data Protection Regulation) is currently much in the news! More documents providing advice and some new or adapted forms are in the pipeline. In the meantime, if you have any urgent concerns, please send them to the Hon. Secretary via the web form on the Contact Us page. 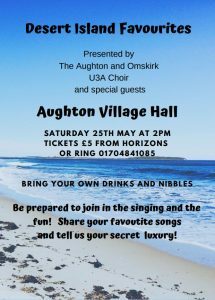 Aughton and Ormskirk U3A has much to be proud of in its 15 years of existence. To this end, a party was arranged on 19 May where speeches, nibbles, and meeting and chatting to fellow members were much enjoyed and appreciated by those who attended. See Let’s Celebrate. The Queen’s Award for Voluntary Service was on display in its fine new casing. The wonderful 10th Anniversary Quilt also made a reappearance at this celebratory ‘do’! Please click or tap to run this gallery with captions. There will be NO Monday Computer Advice session on Bank Holiday Monday, 28 May. But it will be service as usual, next day, on Tuesday 29 May. However, because of low numbers of client on Tuesdays, perhaps partly due to difficulties parking nearby on Tuesday mornings, this will be the last Tuesday Computer Advice session until after the summer holiday. We will review the situation at the end of August. In the meantime, as well as the Monday sessions, there are usually a number of Computer Helpers to be found at the Horizons Coffee Meetings on Thursday mornings. Keep an eye on the Computer Advice Group Page for the latest information. The next meeting – A Fresh Look at Computing with David Sutton = takes place on Tuesday 5 June at 2pm in the Scout & Guide HQ. It is on a topic of general interest ie not too geeky. This talk is aimed at anyone interested in knowing how technology is changing our lives or will affect us in the near future. However, if you are just interested in FUN and interesting things you can do with technology or just seeing strange demos, this is for you to. Visit the Computer Tutorials Group Page for further information. All welcome even if you are not a regular at these Computer Tutorials. In a year when Britain celebrates a Royal Wedding, our U3A has two Anniversaries to celebrate, one with a royal connection. It’s 15 years since the founding of the Aughton & Ormskirk U3A. And 10 years ago this U3A won the Queens Award for Voluntary Service. And just 5 years ago, we were commemorating the 10th birthday with a very special quilt made by talented members. Let us extend a big thank you to all those who helped make the Anniversary Celebration on 19 May 2018 a success. As well as the Anniversary Working Party who planned and coordinated the event (Val Bullen, Linda Burden, Peter Trigwell, Jane Astles, Bill Evans, Alex McMinn, Jeff Roberts), many others also played their part including other members the Management Committee, our Trustees and the Social Subcommittee, plus quite a number of U3A members not on any committee – THANK YOU all for your contributions! Here are two galleries of photos from the recent Anniversary Celebration event held in the Christ Church Ministry Centre on 19 May 2018. Some of these photos feature a number of long-standing members including our founder Chairman, Alex McMinn, member number 1. Click or tap on any photo in a gallery to run that gallery as a slideshow. SAVE OUR GOLF – if you don’t use it you lose it!! Lessons at Mossock Hall have restarted. New ”golfers” welcome. No experience/equipment required. Come along to learn a new skill OR simply to improve your golf skills from professional golf coach Brad. Only £5 per hour, every Tuesday 12 noon to 13.00. In the summer of 2008, thirty of our members, led by Alex McMinn, visited County Hall for the presentation of the Queen’s Award for Voluntary and Community Service to our U3A. The Lord Lieutenant of Lancashire, Lord Shuttleworth, resplendent in his black uniform with a gold belt, red trimmed hat and insignia (I think he wore his sword) handed to Alex the heavy glass trophy amid much applause. It is a lovely piece of glass with an internal engraved logo of the crown composed entirely of tiny human figures standing, some singly but mainly in groups, signifying the individual and group effort that contributed to the achievement. To Aughton & Ormskirk University of the Third Age for providing opportunities for older people to pursue active retirement through social and recreational activities. Given at Our Court of Saint James’s under Our Royal Sign Manual this second day of June 2008 in the fifty-seventh year of Our Reign. The photograph was taken by Eric Rowley, a good friend of our Digital Photography Group, who is now a member of St Helens U3A. Eric became a semi-professional photographer in his retirement and agreed to take a photograph of the Queen’s Award in his studio, with appropriate lighting and background effects. It proved to be a difficult subject, as light, especially artificial light, reflects off the smooth glass surfaces. In this image Eric has managed to create depth and clarity. At a much greater magnification than we can show here, the letters of the logo are composed of tiny human figures, representing the personal effort involved in the achievement of the award. It is the Queen’s Award for Voluntary effort. IMPORTANT NOTICE – Thursday’s Speaker meeting is cancelled. We have just heard from our speaker, who was to have given a lecture on God and Goddesses of Ancient Egypt in Christ Church on Thursday morning. He is unwell and will not be able to deliver the lecture he has prepared. Apologies from your speaker team – it is the first time we have had to cancel. Do come along to Horizons anyway, enjoy a coffee and buy some books. Rest and Relax watching this month’s contribution from the Film Appreciation Group. All members welcome. The 2018 Cricket season is here!